The questions we ask ourselves are: How real is this challenge? What types of experiences are challenger banks creating that might be leading indicators of growth? And what challenges do challengers themselves face in gaining traction in what is, after all, a relatively slow-moving market still dominated by a small number of incumbent retail banks? Challengers are by no means top of mind. Ask people to name a bank, and the first ones that come to mind are the usual suspects: Barclays, Lloyds, Santander, NatWest, HSBC, and so on. Spontaneous awareness is low. Metro and Virgin do OK, with c. 5% spontaneous mentions, but the Fintechs don’t get a look in. However, taking the challengers together, we can see aggregate reach is gradually growing. We expect this (and share of experience) to presage growth via consideration. 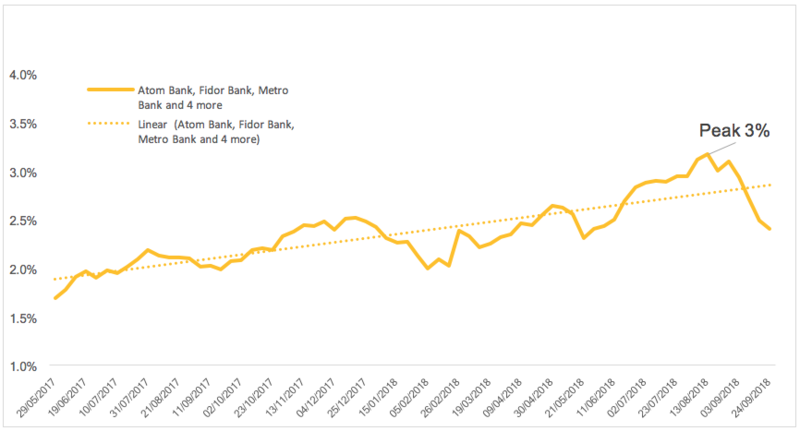 Below we see share of experience (the proportion of all Paid, Owned, and Earned experiences accrued by challenger brands) gradually rising over the last 18 months. And in tandem with this growth in share of experience, we see consideration for some of the main challenger banks rising too. It is entirely in line with the MESH Experience-Driven Marketing model: that is, an increase in Share of Experience will be a predictor of growth. It suggests that gradually, the challengers are beginning to build cut through. The percentages are low, but they’re reliable: after all, we are tracking 35,000 experiences annually. In addition, the current situation is that the challengers are – collectively and individually – delivering excellent (and different) experiences. Atom, for example, is off the chart for positivity. And challenger banks generally generate more earned media experiences (word of mouth, news etc) than their traditional competitors. Indeed, in combination, we see 25% of challenger experiences being from earned experiences (over twice the percentage delivered by high street banks). This speaks to a gathering pace in the all-important background buzz that precedes a tipping point. Whilst currently challengers get great ratings from customers, they are not entirely ‘trusted’ compared with the main players – yet. However, based on the insights we’re getting from our Real-time Experience Tracker, we believe this is likely to change fast. Challengers do have growing momentum, but it will take time to break through in a crowded market. They don’t come with baggage – but nor do they have heritage. Trust is a slow burn. However, steadily increasing share of experience presages growth, especially as these experiences are demonstrably more positive. Challengers are getting good WOM and traction through earned channels generally. This is key to growth, when little is being spent on paid media. Overall, their steadily increasing share of experience suggests the challenge is real; it’s now all about continuing to increase the volume of experiences. And there is certainly no room for complacency amongst the traditional players. To find more about the rise of challenger banks and what’s happening in the market right now, why not talk to us about our Retail Banking Experience Landscape Report? 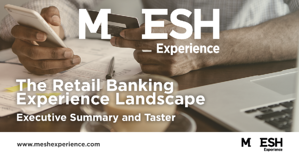 Download our Retail Bank Experience Landscape Exec Summary for FREE to learn more!